An alert about potentially increased risk of heart-related death with febuxostat (Uloric) compared to allopurinol, based on preliminary results from a postmarketing safety trial of more than 6,000 patients that the FDA required the manufacturer to conduct. The agency will provide an update after it reviews the final results. An alert that biotin (vitamin B7) can interfere with certain lab tests and cause clinically significant incorrect test results. An increasing number of related adverse events, including one death, have been reported. A patient was taking high levels of biotin and died following falsely low troponin results on a test known to have biotin interference. The FDA recommends asking patients if they are taking any biotin supplements, including those marketed for hair, skin, and nail growth. A new class warning and other safety measures for gadolinium-based contrast agents used in magnetic resonance imaging. The FDA believes the benefit of these contrast agents outweighs the risks but is concerned that gadolinium is retained in patients' bodies, including the brain, for months to years after administration. In addition to requiring a new patient medication guide, which patients will be asked to read before receiving a gadolinium-based contrast agent, the FDA is also requiring manufacturers of the contrast agents to conduct safety studies in humans and animals. A recall of two lots of metformin hydrochloride oral solution (Riomet) by Sun Pharmaceutical Industries due to fungal contamination. The affected lots were contaminated with Scopulariopsis brevicaulis, posing infection risks, most likely in the respiratory tract and in immunocompromised patients. A recall of 14 lots of diphenoxylate hydrochloride and atropine sulfate tablets by Greenstone due to potency concerns. Batches recalled due to potential subpotency or superpotency were distributed nationwide between November 2016 and June 2017. No related adverse events have been reported. An alert that the FDA is investigating serious adverse events related to Limbrel capsules. Reports of two potentially life-threatening events, drug-induced liver injury and hypersensitivity pneumonitis, have been associated with the product, which is being marketed as a medical food to manage the metabolic processes associated with osteoarthritis. At least 194 adverse events regarding the drug have been reported. As the FDA reviews the drug's formula, it advises that consumers avoid the product. A recall of three lots of Pharmacist Choice Alcohol Prep Pads due to a lack of sterility assurance and other quality issues. Affected products, manufactured by Foshan Flying Medical Products Co. Ltd., were distributed between Oct. 18, 2016, and July 19, 2017. Once-monthly injectable buprenorphine (Sublocade) to treat moderate to severe opioid use disorder. The drug is indicated for adults who have been on a stable dose of transmucosal buprenorphine for at least seven days. In clinical trials, patients who received the drug had more weeks without positive urine tests or self-reports of opioid use than those who received placebo. The most common side effects were constipation, nausea, vomiting, headache, drowsiness, injection site pain, itching at the injection site, and abnormal liver function tests. A boxed warning includes information about the risks of intravenous rather than subcutaneous administration, such as occlusion, tissue damage, and embolus. The drug will be provided to clinicians through a restricted program and will be administered only by health care professionals. Dolutegravir and rilpivirine (Juluca), the first two-drug regimen for certain patients with HIV. The fixed-dose tablet is indicated for adults with HIV-1 infection whose virus is suppressed on a stable regimen for at least six months, with no history of treatment failure. A trial of 1,024 patients found that those who switched to the regimen from their current anti-HIV drugs had virus suppression comparable to those who continued their current regimen. The most common side effects were diarrhea and headache, and serious side effects include skin rash and allergic reactions, liver problems, and depression or mood changes. The drug should not be given with other anti-HIV drugs and may have drug interactions with other medications. The first telehealth option to remotely program cochlear implants. The remote feature for the Nucleus Cochlear Implant System is indicated for patients who have six months of experience with their cochlear implant sound processor and are comfortable with the programming process. In a study of 39 patients with cochlear implants, there was no significant difference in speech perception test results one month after an in-person versus remote programming session. A new indication for an electric stimulation device to help reduce the symptoms of opioid withdrawal. The device, called the NSS-2 Bridge, is a small electrical nerve stimulator placed behind the ear. Using a battery-powered chip that emits electrical pulses, the device stimulates branches of certain cranial nerves to provide relief from withdrawal symptoms. Patients may use the device for up to five days during the acute physical withdrawal phase. In a single-arm study of 73 patients undergoing physical withdrawal, all patients had a 31% or more reduction in Clinical Opiate Withdrawal Scale score within 30 minutes of using the device. Overall, 64 of 73 patients (88%) transitioned to medication therapy after five days of device use. The device, formerly known as the electro auricular device, was initially approved in 2014 for use in acupuncture. It is available by prescription only and is contraindicated in patients with hemophilia, cardiac pacemakers, and psoriasis vulgaris. Insulin lispro injection (Admelog) to improve glucose control in patients ages three years and older with type 1 diabetes and adult patients with type 2 diabetes. The drug is the first short-acting insulin to be approved as a “follow-on” or “me-too” product (its approval was partly based on the FDA's finding of safety and effectiveness for Humalog, another insulin lispro injection). Emicizumab-kxwh (Hemlibra) to prevent or reduce the frequency of bleeding episodes in patients with hemophilia A who have factor VIII inhibitors. In a randomized trial of 53 patients, those who received the weekly subcutaneous injection had about 2.9 treated bleeding episodes per year, compared to about 23.3 in those who did not receive prophylactic treatment. Common side effects include injection site reactions, headache, and joint pain. A boxed warning states that severe blood clots have occurred in patients taking the drug who were also given a rescue treatment (activated prothrombin complex concentrate) to treat bleeds for 24 hours or more. Voretigene neparvovec-rzyl (Luxturna) to treat patients with confirmed biallelic RPE65 mutation-associated retinal dystrophy. The orphan drug works by delivering a normal copy of the gene to retinal cells. It is the first FDA-approved, directly administered gene therapy that targets a disease caused by mutations in a specific gene. In a phase 3 study of 31 participants, those who received the gene therapy saw significant improvements in their ability to navigate an obstacle course in low light compared to a control group. The most common side effects were eye redness, cataract, increased intraocular pressure, and retinal tear. The first implanted lens that can make small adjustments after cataract surgery to correct small refractive errors without eyeglasses. The RxSight Inc. Light Adjustable Lens and Light Delivery Device is indicated for patients who have astigmatism in the cornea before surgery and who do not have macular diseases. In a clinical study, patients who received the device saw an improvement of about one additional line down the vision chart compared to patients who received a conventional intraocular lens. The device is contraindicated in patients taking medications that can increase sensitivity to UV light and in those with a history of ocular herpes simplex virus. A new indication for mepolizumab (Nucala) to treat adults with eosinophilic granulomatosis with polyangiitis (formerly known as Churg-Strauss syndrome). 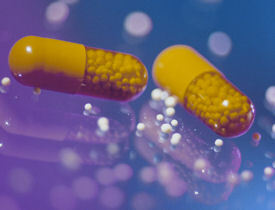 The drug is the first therapy specifically approved by the FDA to treat the condition. In a yearlong trial in patients who continued their stable daily oral corticosteroid therapy, those who received 300 mg of the drug subcutaneously once every four weeks spent significantly more time in remission compared to those taking placebo. The most common side effects were headache, injection site reaction, back pain, and fatigue. Vestronidase alfa-vjbk (Mepsevii) to treat patients with mucopolysaccharidosis type VII (aka Sly syndrome). A trial of 23 patients who received the orphan drug found varying improvements in central nervous system manifestations of the disease. The most common side effects were infusion site reactions, diarrhea, rash, and anaphylaxis. A new indication for sunitinib malate (Sutent) as an adjuvant treatment for adults at high risk of renal cell carcinoma returning after nephrectomy. The kinase inhibitor was first approved in 2006 to treat certain patients with gastrointestinal stromal tumors and advanced renal cell carcinoma, and it is also approved in patients with a certain type of pancreatic cancer. Approval for the drug's new indication was based on a randomized trial of 615 patients in which, after five years, 59.3% of patients who received the drug had not experienced cancer recurrence or death, compared to 51.3% of those who received placebo. Common side effects include fatigue, diarrhea, mucositis, nausea, anorexia, vomiting, and abdominal pain, while severe side effects include hepatotoxicity, low left ventricular ejection fraction, myocardial infarction, prolonged QT interval, hypertension, and hemorrhagic events. A boxed warning cautions about the risk of hepatotoxicity, which may result in liver failure or death. Trastuzumab-dkst (Ogivri) to treat patients with breast cancer or metastatic stomach cancer whose tumors overexpress the HER2 gene. A biosimilar to trastuzumab (Herceptin), the drug is is the first FDA-approved biosimilar to treat breast or stomach cancer and the second FDA-approved biosimilar to treat cancer. Approval was based on various clinical safety and effectiveness data demonstrating biosimilarity to trastuzumab. Common side effects for the treatment of breast cancer include headache, diarrhea, nausea, chills, fever, infection, congestive heart failure, insomnia, cough, and rash. Common side effects for the treatment of stomach cancer are neutropenia, diarrhea, fatigue, anemia, stomatitis, weight loss, upper respiratory tract infections, fever, thrombocytopenia, mucosal inflammation, nasopharyngitis, and dysgeusia. Serious side effects include worsening of chemotherapy-induced neutropenia. The drug label contains a boxed warning about increased risks of cardiomyopathy, infusion reactions, pulmonary toxicity, and embryo-fetal toxicity. A finalized rule that 24 active ingredients can no longer be used in over-the-counter health care antiseptic products because they are not generally recognized as safe and effective. Of all the banned ingredients, triclosan is the only one that is currently being used in these products, which include hand washes and rubs for health care personnel, surgical hand scrubs and rubs, and patient antiseptic skin preparations. Manufacturers have one year to comply with the rule by either reformulating their products or removing them from the market. The FDA has deferred final rulemaking by one year for six other active ingredients that are more commonly used: alcohol (ethanol), isopropyl alcohol, povidone-iodine, benzalkonium chloride, benzethonium chloride, and chloroxylenol. New websites for clinicians to get updated information on antimicrobial susceptibility breakpoints. In an effort to help clinicians make more informed prescribing decisions, dedicated web pages will share and update information on FDA-recognized breakpoints for both antibacterial agents and antifungal agents. Fluoxetine tablets USP (60 mg) to treat major depressive disorder, obsessive compulsive disorder, bulimia nervosa, and panic disorder, with or without agoraphobia.